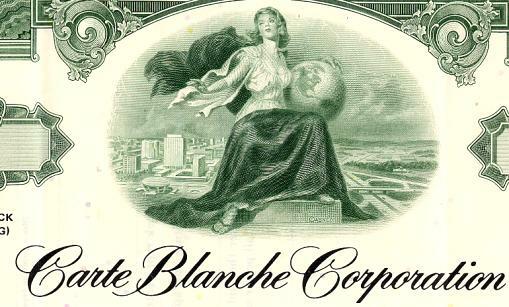 Beautifully engraved Certificate from the famous Carte Blanche Corporation issued no later than 1973. This historic document was printed by the American Banknote Company and has an ornate border around it with a vignette of a women hold a globe with a city in the background. This item has a printed signature of the company's president and secretary and is over 32 years old. 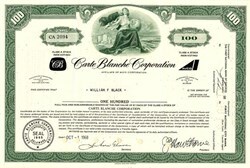 Citicorp purchased Carte Blanche Corporation in 1978. The is now a Diners Club Carte Blanche Card for individual business people and professionals which provides an expanded array of premium features and valuable benefits, along with special privileges available exclusively for this elite Cardmember.